Villa for sale in Moraira. 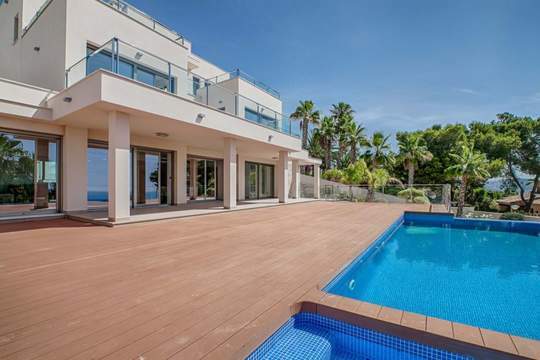 A stunning looking four bedroom, five bathroom, (four en-suite) detached villa with uninterrupted 180 degree sea views from Cap d'Or in Moraira to the Peñon de Ifach in Calpe. This prestigious villa is currently under construction for completion in Autumn 2018. From road level the villa rises up four levels with lift and stair access to the top floor. The ground floor comprises the double garage, a laundry, a wine cellar, a store room and an equipment room. The next floor above the garage will be according to the buyers wishes which can be a gymnasium, games room, home cinema etc. The main living floor is on the next level with the 10x4 metre swimming pool. The living-dining area is open plan with an open kitchen and a second kitchen/bar and dining room outside. One of the four en-suite bedrooms and a guest a guest toilet are also on this floor. The top floor houses two more doubles with en-suite bathrooms and the fabulous master bedroom with a sitting room and an en-suite with both a bath and a shower. All have direct access to sun terraces.